Indeed, Igarashi’s sculpture is quite fetching, and, more interestingly, quite varied. Aside from an early, sharp bent toward the geometric, his three dimensional portfolio has moved the air and light around it in immeasurably varied currents. Monolithic, provincial, heavy, grounded, sharp, useful, clever, whimsical, delicate, charming, airy, diaphanous, breathtaking; it’s all there, in as many materials as you can imagine. Between Igarashi’s graphic design and his more abstract sculpture lies what may be his most sagacious work: that of product design. Included in this portfolio is everything from traditional designer favorites such as clocks and lamps to more pedestrian subjects like notebooks and gardening kits. 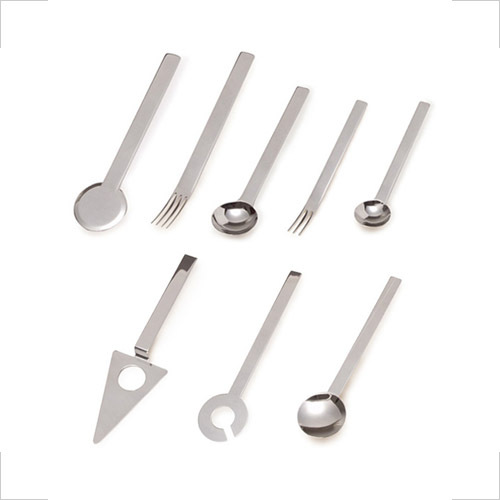 Every one of these pieces is designed with a specific purpose and inventive spirit, and all represent the striking clarity and modern austerity that Igarashi has espoused throughout his career. 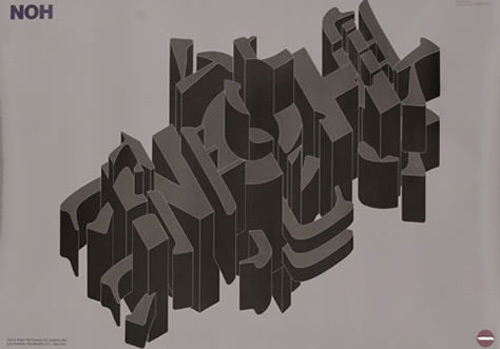 In his graphic design material, however, he was famous for an interesting but quickly dimming shtick of hyper-complex, axonometrically drawn type constructions, grounded in International-Style content structure. That is a charming statement, but is he really serious? He couldn’t even keep his own portrait simple (the digital slash is all him, not me). More to the point, can anyone even read those words he made? They are stunning feats of geometry—really quite impressive, even beautiful at times—but completely incomprehensible. And, how is this shtick appropriate for an international Expo, a calendar, a shoe store and jazz and dance performances? UCLA Asian Performing Arts Institute 1981; designed by Takenobu Igarashi; 40.5 x 28.7in. (103 x 73 cm) / 1981. I find this poster quite interesting, but I only know what it says because of the title set in Helvetica in the upper left corner, and I still have no idea what it means. 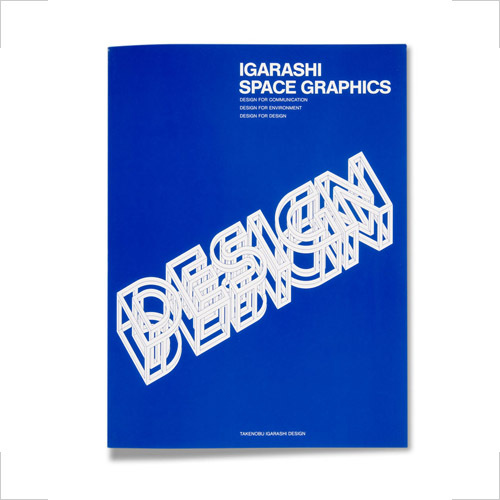 Despite his sometimes confoundingly intricate axonometric typography and abstract sculpture, Takenobu Igarashi was and is today a professed Modernist, perhaps even minimalist. 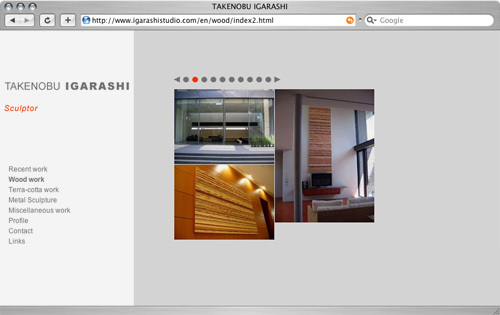 Igarashi has made a concerted effort to lead a simple life even after attaining great status and success. He has often spoken out against rampant consumerism and information pollution of cities like Tokyo. He even had a small house in the country (designed for him by an architect friend of his) just to get away from it all. He selects every item for his personal consumption just as he selects clients: very carefully and sparingly. 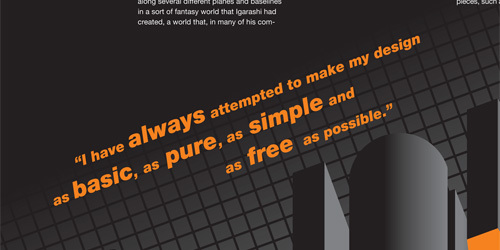 Igarashi’s current web site actually seems to harmonize with his professed philosophy. I find the synthesis impressive and satisfying. 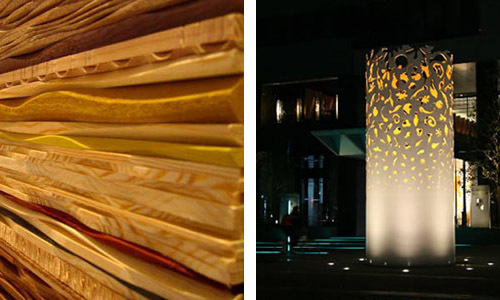 He shows a gorgeous variety of sculpture, set in a calm, austere gallery. And, there’s not a hint of his graphic design work anywhere. Hi Randy (if that is really you; my comment filter seems to think your note may be spam, but it sounds like a reasonable question)… This layout was originally based on one of the zillion user-submitted WordPress templates, but I’ve hacked it so extensively that it no longer bears any resemblance to said template whatsoever. Love the blog. 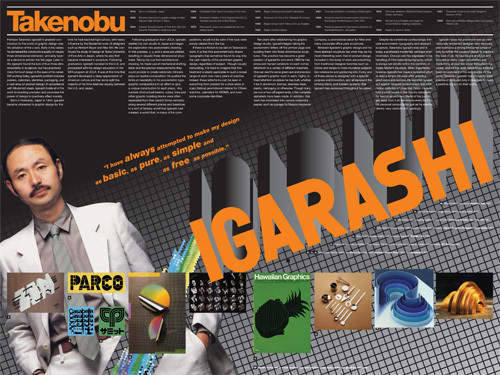 I actually found it because I am writing a paper about Igarashi. I have looked at his site and a few various places online, but I can not find a difinitive place that has a decent biography about him. Do you have any suggestions? Or maybe any help as to where you were able to find information about him?